Ordnance Survey Ireland (OSi) is Ireland’s National Mapping Agency and has been mapping Ireland in detail since 1824. Their unique data supports the social, economic, legislative and administrative functions of the Irish state, and Ordnance Survey products and services are widely used in almost every sector of Irish society. In fact, there is hardly an area of our society that doesn’t rely on the unique data that Ordnance Survey Ireland gathers, with State and commercial organisations constantly applying it to help make effective decisions informed by a knowledge and understanding of location. From tourist and leisure maps to professional mapping that encompass everything from boundaries data to environmental features, we would all be lost without the innovative and far-reaching impact of the work of Ordnance Survey Ireland. But even Ireland’s greatest mapping experts sometimes need a map of their own – especially when it comes to navigating complex quality management systems. It was a typically innovative and ground-breaking project that first introduced OSi to the benefits of the need for robust and highly effective quality management systems, and paved the way for their future ISO 9001 certification that was achieved in June 2014. This journey started back in 2010 when the Irish Aviation Authority (IAA), contracted OSi to provide aeronautical data (specifically, obstacle and terrain data), within a 10Km radius of eleven airports in the state including Dublin, Shannon and Cork. 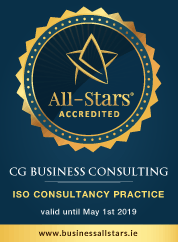 And when the day came that the IAA carried out a two-day audit to ensure that OSi was conforming with International Civil Aviation Organisation (ICAO) requirements, OSi’s desire to further develop their own ISO documented quality management system was born. And what advantages has OSi seen since achieving ISO 9001 accreditation? Susan again: ‘It allowed us to identify gaps or blocks in information between departments. It also provided an integrated management system that other sections of the organisation can adopt, and it has enhanced our commitment to providing quality customer service in the future. Now, thanks to partnering with CGBC, Ordnance Survey Ireland have a quality management system map that they follow to this day.